CRD Construction Ltd. | The CRD Construction Advantage | CRD Construction Ltd.
What is the advantage of using CRD Construction? Superior quality, clear communication, and experienced personnel. At CRD Construction, we understand the importance of taking pride in the finished product, especially with public-facing projects. Everyone should be eager to showcase the end result of a new build — from our team, to the clients, to the employees of the business. When we start working on a new industrial, commercial or institutional facility, it is with the expectation that many people will use it on a daily basis, visit it and pass by the building. The standards are higher than a typical construction project. CRD Construction has been working on these types of projects for over 30 years. We have become a leader in the field by fostering strong partnerships with customers and suppliers, offering value-add products and services, and making a commitment to on-time construction schedules and cost control solutions. Want more information about our experience in the industry? Learn about two of CRD Construction’s flagship projects: Hospice Wellington and Héroux-Devtek Aerospace manufacturing facility. CRD Construction was contracted in 2007 to serve as the Construction Manager on this $4 million dollar project, based on a pre-qualification and interview process. We worked directly with the Building Committee and the architecture firm, J. David McAuley Architect Inc.
During the planning process, our team worked closely with the Committee to review a number of different construction options in detail — from a simple renovation of the existing church building, to multiple additions, and even a complete demolition and rebuild. Our role in the process was to ensure the final design would meet the needs of the organization. We were also able to assist with researching and sourcing materials and equipment, providing recommendations on the various options, and presenting alternative ideas to stay within the budget and timeline. Based on our suggestions, the Committee decided on a design that involved the demolition and reconstruction of a large portion of the existing building, as well as a 8,000 square foot addition. The project was completed in 2010. 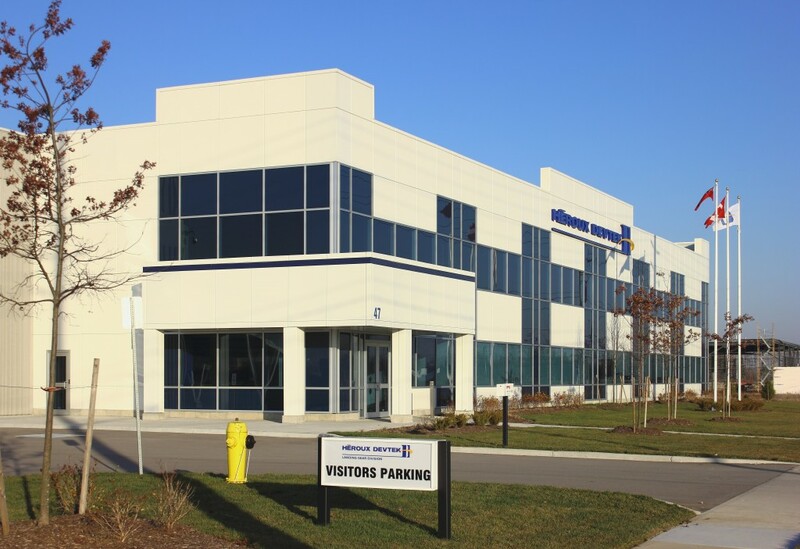 In 2005, CRD Construction was contracted by Héroux-Devtek for the design-build of a 28,000 square foot addition to their Kitchener Facility. As a result of this successfully completed project, CRD was contacted again in February, 2014 to design and build the new 100,000 square foot manufacturing facility of Héroux-Devtek Aerospace in Cambridge. Héroux-Devtek is an international company specializing in the design, development and manufacture of landing gear, actuation systems and components for the aerospace market. This $10 million dollar project was particularly challenging due to the size of the facility and the timeline requested by Héroux-Devtek. After initial contact and review of the building requirements, CRD co-ordinated with the civil engineers to begin development of the site plan and analysis of the existing soil and grading conditions. With the site plan underway, CRD assembled its team of architects, structural, mechanical and electrical engineers to expedite the construction drawings and submission for Building Permit approval. Design elements such as the use of precast concrete wall panels around the manufacturing portion of the facility were implemented, as a means of meeting the required timeline. Site Plan approval was received in May 2014. Immediately upon receipt of Building Permit approval in June 2014, work commenced with a seven month construction schedule. CRD Construction finished the manufacturing facility in January 2015, meeting the project deadline. Héroux-Devtek Aerospace was able to begin production in the new building in Spring 2015. The two-story office portion at the front of the building was completed with aluminium composite panels, aluminium curtain wall, and glazing exterior to display a contemporary, yet timeless finish. The site plan and manufacturing portion of the building were designed to accommodate two future 50,000 square foot expansions. Want to learn more about us? Contact CRD Construction to start a conversation about your next construction project in the Guelph or KW area.